We live in one of the most interesting and challenging business environments the world has ever known. To keep up with the shifting trends and to come up with innovative solutions to new problems, many companies spend billions of dollars on employee education and corporate training programs. However, according to one research, many of these programs don’t work. The problem is that some of the most common strategies for retaining knowledge are outdated and not very effective. 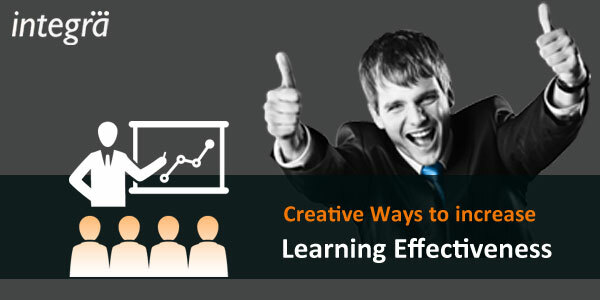 To increase the learning effectiveness of your corporate training programs, you need to get your employees on board with new ideas and make them eager to learn. That’s often easily said than done. To help you foster a culture of continuous erudition, here are four creative methods of increasing learning effectiveness. Pressed by urgent tasks and always on-the-go, employees don’t want to sit through a two-hour eLearning course to get the information they need. Instead, you can create short educational videos that they can access on their computers or smartphones anytime, anywhere. To make this type of corporate training effective, it’s paramount to have bite-sized chunks of information readily available to your employees so they can be accessed on demand. Easily accessible and effective, eLearning programs can be a valuable asset, especially under time and budget constraints. More than that, thanks to Gamification, engagement and retention are improved. And it’s not just Gamification. Employers can use various sophisticated learning tools to match aptitudes with the learning goals achieved by employees. Switching roles and allowing the student to become the teacher is another great way of absorbing information and increasing learning effectiveness. Encourage your employees to explore a topic on their own and express important ideas in their words. Invite them to create blog posts, podcasts or presentations that explore a new topic. There are numerous online tools, such as Google Chrome Apps or social media platforms you can use to enable collaboration, even among remote employees. For instance, you can assign them a group task and ask them to complete the task exclusively through online group work. This is an excellent way for team members to learn and retain new information. There is no question that employee development can give a business a competitive edge. Using these tips, you can increase the learning effectiveness of your corporate training programs and also give your employees the chance to benefit from the knowledge acquired.